It’s not beginning to look a lot like Christmas – and thank goodness for that. But now is the perfect time to plan how you will keep Christ in the centre of your celebration before the busyness of the season snowballs you. I asked a bunch of friends for ideas on how they kept Christ the centre of their Christmas. It was a sneaky way of getting new ideas to use for our family this year…hee, hee. I received so many great, creative ideas that I wanted to share them in case you wanted a new idea too. This is the first of several posts that will focus on how we can teach our children the importance of Christmas. Gather some families and go carolling door-to-door in your neighbourhood. This is a great way to invite neighbours to your Christmas advent and Christmas eve Church services. Make sure to have a handout that also includes the Christmas message of reconciliation with God through Christ. When we did this, we found our neighbours were flabbergasted that we were not collecting for a cause, and very touched by the gesture. Find a way to bless the poor in your city with a gift. 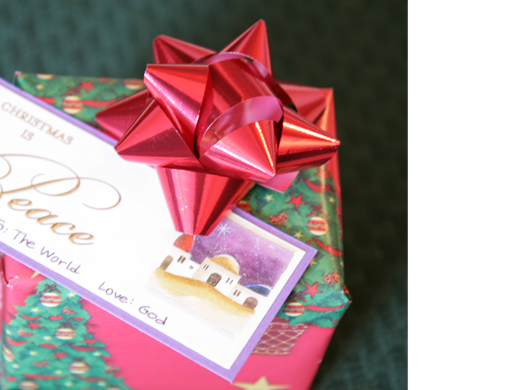 Many inner city missions provide opportunities to provide Christmas gifts to needy families. Make sure yours includes a Bible and/or something about the reason for Christmas. Soup kitchens and shelters have service opportunities over Christmas as well. Find one that your children can participate in. Operation Christmas Child shoeboxes are a tangible way for children to give a gift to a needy child around the world. They always contain the gospel message and are distributed in collaboration with local churches, so you know follow up will occur. For those who hate shopping, there is even an online option for packing a shoebox! Provide a Christmas relief package to a persecuted Christian through Voice of the Martyrs. Persecuted Christians always say it is a huge encouragement and support to learn that the body of Christ is aware and cares about their plight. Other organizations that support persecuted Christians worldwide will also have similar giving opportunities. Find a VOM office near you. Many organizations have Christmas gift catalogues which allow you to purchase a gift for a poor family in the name of a family member of friend. Be sure to go with a Christian organization who will make the gospel part of the gift. How about making your gift a real sacrifice: what if the members of your family received one less gift than normal and that money was used to buy something for a poor family somewhere around the world? This would provide a tangible lesson in sacrificial giving, similar to what God did for us through sending Jesus. Finally, refuse to give in to the politically correct jargon that is used to smother Christmas. If someone wishes you a “Happy Holidays”, wish them a ‘Merry Christmas’ back. If your office is having a Holiday Party, call it what it is: a Christmas Party. We’ve been surprised at how people take note of this simple way to keep Christ in Christmas! If you have Christmas traditions that you’ll let me share with others, send me an email and I’ll include it in one of my upcoming Christmas posts!